Village animals are surprised when The Kool Kats’ large bus gets stuck in the sand near their village, and the supposedly sophisticated rock stars (Lion, Miss Leopard, Cheetah, and Impisi the hyena) helplessly whine about and bemoan their predicament—and the lack of GPS or cellphone reception seems insurmountable to them. The resourceful village animals come to their rescue, inviting them home for the night, digging out the bus the next day, and throwing a dance party celebration the second night. With this successful conclusion to The Kool Kats’ problem, the village animals realize that their own life is just fine. 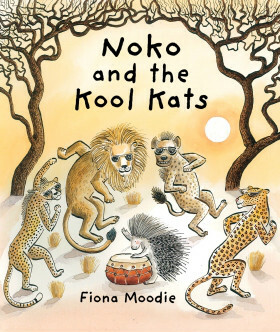 Noko the porcupine and friends live and work together in an African village, pleasantly spending their days planting mielies and nights making music. However, a newspaper story about The Kool Kats’ rock concert in the Big City does make the animals yearn for more excitement and wonder what they are missing. One day they are surprised when The Kool Kats’ large bus gets stuck in the sand near their village, and the supposedly sophisticated rock stars (Lion, Miss Leopard, Cheetah, and Impisi the hyena) helplessly whine about and bemoan their predicament—and the lack of GPS or cellphone reception seems insurmountable to them. The resourceful village animals come to their rescue, inviting them home for the night, digging out the bus the next day, and throwing a dance party celebration the second night. With this successful conclusion to The Kool Kats’ problem, the village animals realize that their own life is just fine. Moodie’s original, modern fable echoes classic folktale motifs, such as smaller animals helping bigger ones, solving a problem with brains and by working together, the very ones that should be helping are too lazy, and village life is just as good as city life. This final message is implicit in the story, which entertains in itself. As Moodie notes (Hill, 2014), together these themes exemplify the spirit of Ubuntu, or “everyone is family” and “we are all responsible for each other” (p. 180). Charming illustrations complement the narrative with double page maps as both preview and postscript. Characteristics authentic to the setting weave throughout text and images in the earthy colors, landscape features of southern Africa, distinctive vegetation, traditional designs on the van, musical instruments used by the village animals (box guitar, “calabash-thing,” kudu horn, etc. ), types of animals (in addition to the more familiar ones of the rock band)—warthog, pangolin, bushbaby, aardvark—and their names (such as Ufudu, Takadu, and Mara Boo). As noted by Hill, Moodie’s work displays “an acute sense of the particular details that define a setting” (p. 173), in which “the familiar becomes magical” (p. 180). In contrast, the rhymes of the songs the animals compose lack the polish of Moodie’s artistry and seem spontaneous and more amateurish, perhaps deliberately reflecting the playful, simple nature of their fictional creators. This title is the third Noko story—the others being Noko and the Night Monster (2001) and the 2007 Noko’s Surprise Party—about the porcupine and friends. These stories and Moodie’s retelling of Nabulela (1996), a North Nguni folktale, “represent a homecoming,” according to Hill (p. 179) for the South African native, whose other work has included many European tales. The quality of her artistry has been recognized by the biennial Exclusive Books/IBBY South Africa award for best picture book in this Noko story and earlier for Fynbos Fairies, written by Antjie Krog (2007). She also collaborated with Linda Rode on the multiple award-winning In the Never-Ever Wood (2009), a masterful collection of sixty folk and classic tales. With each work, Moodie’s distinctive, somewhat naïve, style seems to be evolving and becoming more self-assured and, in the current, highly recommended title, pairs well with Dianne Hofmeyr’s retelling, The Magic Bojabi Tree (2013), and Beverley Naidoo’s Aesop’s Fables (2011), both illustrated by Piet Grobler. Hill, Anne. (2014) “An Odyssey Through Fantasy: Fiona Moodie’s Long Journey Home.” In Creating Books for the Young in the New South Africa, edited by Barbara A. Lehman, Jay Heale, Anne Hill, Thomas van der Walt, and Magdel Vorster (pp. 173-181). Jefferson, NC: McFarland.